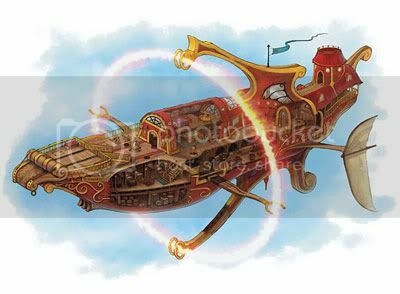 I created a thread for Known Eberron Airships here. What known Skyships are found in Mystara? The Princess Ark: Family vessel of the Haaken Royal family of the Kingdom of Ar. Currently under the command of Prince Haldemaar. Azlum Swith's Geodome Airship: Azlum Swith is a (gnome?) exploring Mystara and adjancent planes in his Geodome. Oberack's Dragon Prow Longship: Built by Oberack, a mage from Ostland and his second in command Kleng Bighand who controlls the White Dragons pulling the vessel. Elven Swan Ship: Created by Asvoria Treesearcher of the Feadiel Clan. Designed to search for other Trees of Life. The Flying Barge of Sayr Ulan: Designed by Jarita Maruti for Rajadhiraja Chandra ul Nevi of Sindh after the Princess Ark visited Putnabad. The Airship of Love: Large Flying Luxury Liner based in Rainbow Park on Gaity. Hot Air Baloon: Description says this device is from the World of Greyhawk, but undoubtedly also found in Mystara since they are included in this book. Jaggar's Transforming Gargantoid - Built by Prinz Jaggar von Drachenfels of Glantri, this gigantic humanoid construct also has flying and submersile capabilities. 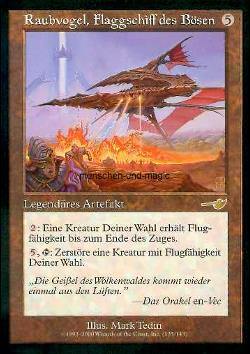 Volospin's Dragonfly of Doom - Built by Prince Volospin Aendyr of Glantri. The Concordia: The first and only Skyship built by Karameikos. Captain Blotomus' Hammership: This is actually a Spelljammer Ship that visited Karameikos at one point. Raver's Dragonship: This is a Neogi Spelljammer Ship hunting for Captain Blotomus. The Motherlode Rover (B8, p20) - Created by the Gnome Robern "The Stubborn" Sternslate - this ship is described as a seagoing vessel, but since its creator has never seen an ocean, he has been unable to test it. As a non-canonical suggestion, perhaps Sternslate added flying capabilities later in his career? Might help him find that Ocean at some point? Flying Disk of Blacklore (Hollow World Boxed Set) - Personal Travelling Device. Does not work outside of Blacklore Valley. AlBehd airship- could easily be a airvessel from Sind, Ylaruam or Davania Desertnation. By Robin (adapted from Magic the Gathering). Pegasus class Thyatian skyships created by James Ruhland. Devil Ray class Thyatian skyships created by James Ruhland.